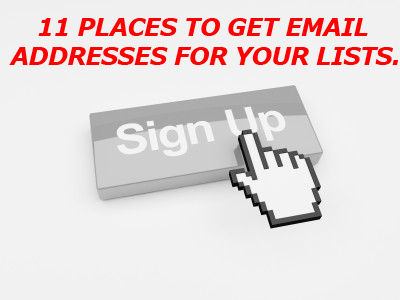 Today we are going to look 11 places to put AWeber Opt-in forms (or a couple of other ways) to collect the email address from leads for your lists. Collecting names for your list in multiple places will help take your list building to the Next Level. The is part of an ongoing series on AWeber. We have covered a little more than their very basic introductory material. 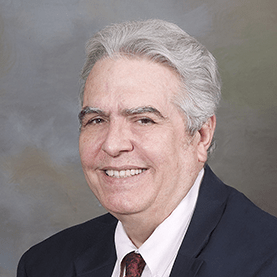 Then covered Creating Lists including Dr. Hale’s 4 List System – how to create and manage lists so that you can have multiple Ethical Bribes and still maintain one (or two) email follow-up sequences. We Built a Widget with our Web Form and PowerPoint. We covered AWeber Tips and Suggestions to improve the quality of the emails you send out. I will mention again that AWeber’s tutorial videos are excellent. They give you good information, I just didn’t get the overview that I’m trying to give you here. I also have used their support email system. I almost always get a very prompt and useful response. 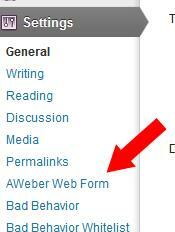 There are lots of ways to use AWeber. I’m going to show you what works for me. Others may show you something different. Here are some AWeber tips to help you build your list. We often hear “The fortune is in the List”, but we usually think that creating an Ethical Bribe and trading an info product or a discount coupon for a person’s name and email are the only ways to add to our lists. 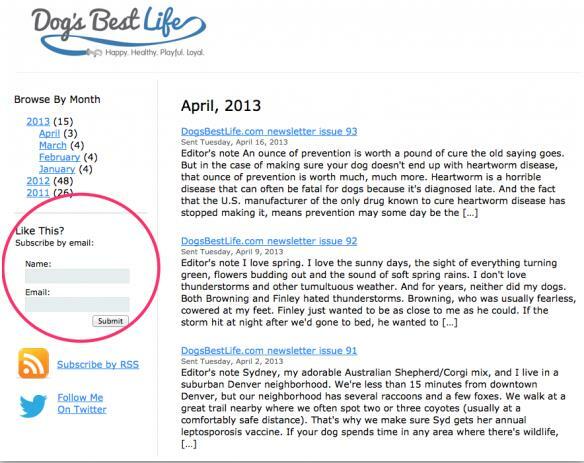 Previous posts talked about the two common places we place Opt-in forms -on Simple Squeeze Pages and in Widgets on the sidebar of your WordPress Pages. Now here are some AWeber Tips that show you a total of Eleven places you can collect names for your lists. This is one of the “Standard” places. Note. If you have a number of free eBooks or eReports you can create a Resources page and link each one to a Squeeze page. I talk about that in this blog post on Creating a Resource Page. This is the second “Standard” place. These are a little more rare, especially the Header Widgets. Many WordPress themes do not support them, but some do. Themes like Genesis – Generate and the Premise Plugin allow these. Here is an example. There are so many of these that I’m not even going to try to show you one. AWeber does have one. AWeber Tips – Place #6 – Your Prospects can send an email to AWeber and automatically get added to a list. Here is one that many should know, but don’t. 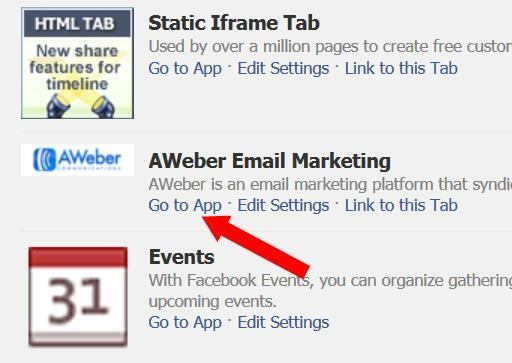 If someone sends an email to <yourlist>@AWeber.com they will be automatically added to that list. You will only have their email, but they will be on the list. This is useful when you are talking to people, emailing your friends or speaking in a public forum. Create a new List and name it something unique that tells you that the people added to this list came from Facebook. Create a Day 0 follow-up email thanking the lead for joining the list and giving them the download links to your free gift(s). Create a Web Form telling the Leads about the free gifts and what they are signing up for. 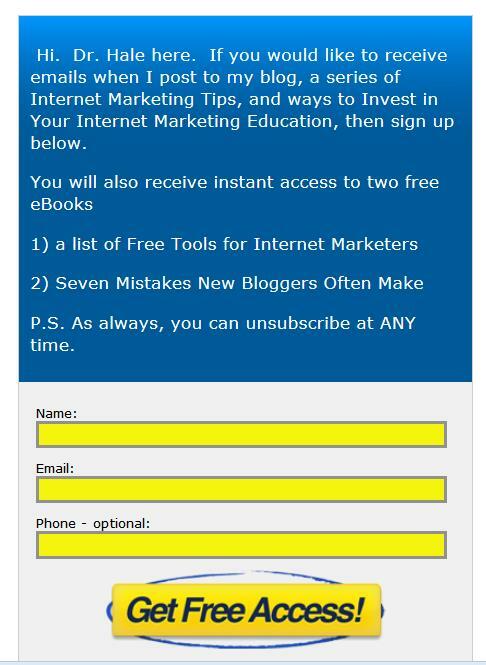 You will need to decide which Thank You Page or offer you want to them to after they sign up for your list. Note: This is a good example of why I suggest Dr. Hale’s Multi-List System. We are adding a new source and it merges right into the existing drip email system seamlessly. When you click on the Add App to Page button it will ask you which page to add the app to. 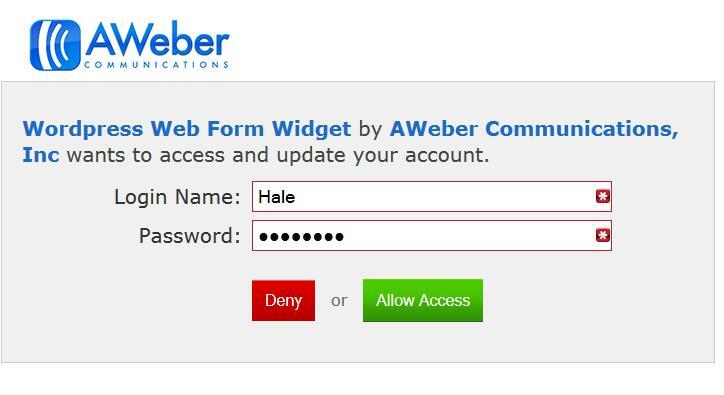 It will ask you to sign in to your AWeber account. Then it will show you this page. 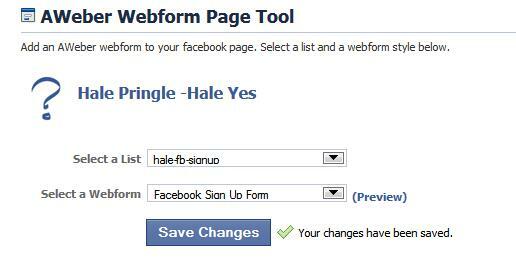 You choose the list you want leads to get added to and the Web Form that should be displayed. You now have a new Tab. It is VERY plain, but if someone clicks it they will see your Web Form. Here is the original Tab. 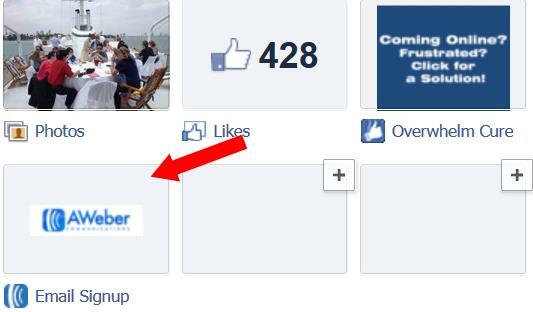 Here is a sample AWeber Web Form Displaying on my Facebook Page. First you need to create an image 111 pixels wide and 75 pixels tall. You can use http://Pixlr.com or I use Photoshop Elements. The Edit Settings Screen will pop up. This screen will appear. Click on “Change” and you can upload your new image. (There are a couple of screens there but they are VERY standard “upload a file” instructions.) You can also change the text under the tab here if you want to. Once you are done, you will have a new tab with your image. Before you start this you need to decide which list you want to attach people to. 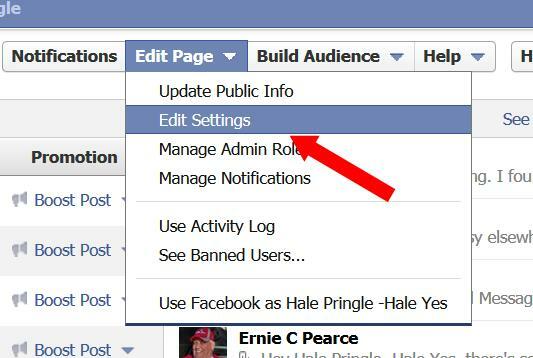 If you are using Dr. Hale’s Multi-List System you will do the following. 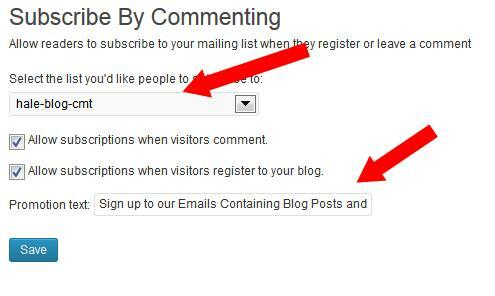 Add a Day Zero email to you blog-comment list. Thank them for signing up. Give them something to download and maybe a useful tip. Duplicate the Day Zero email and add a “I sent this a couple of days ago, but in case you missed it, here it is again. This is Day 2. You do NOT need a web form here. The AWeber Plugin we are going to load has two parts. We are only going to use the Subscribe when a Person Comments section. People seems to have problems with the widget portion of this plugin. 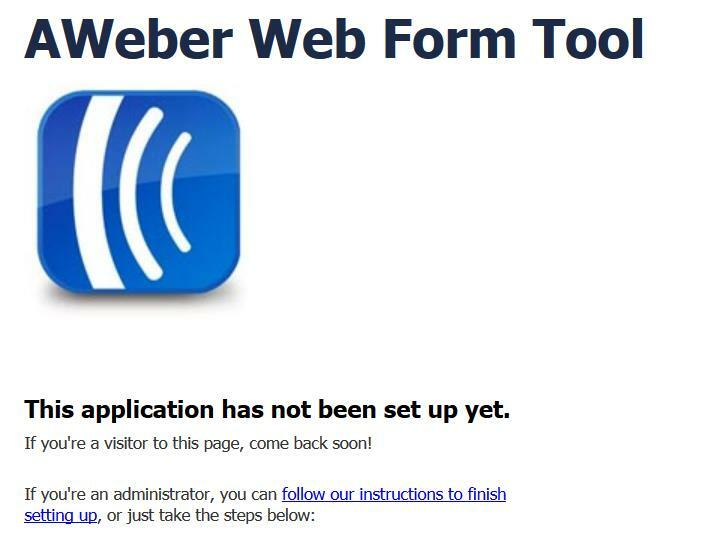 Step 1 – Install the AWeber Web Form Plugin. Just like any other plugin click on Plugins –> Add Plugin and enter the name in the search bar. When you find it click the Install button. Then activate it. You can click on the underlined word or the Setting Menu in your Dashboard. It will ask you to login to AWeber. A new window will open with a very long code. Here is part of mine. Once you have connected, you will see the options. Choose the list you just created. You might want to change the last line on this screen. This is what people see in your blog. Press SAVE and you are done. When you add a link in your Broadcast email so that people can view the email in their browser instead of their email client, you are sending them to AWeber’s archive page. This page automatically has an Opt-In form on it. Be Careful – if someone signs up here, your Day Zero and Day 1 emails may not be appropriate. For example if your Day Zero email says “Thanks for Asking for My Free EBook” it isn’t going to make much sense to people who signed up here. 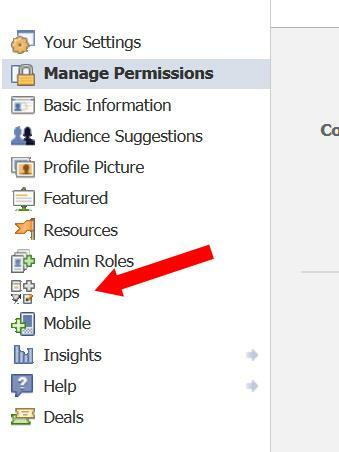 I just going to send you to AWeber’s post on this option. People looking at your archive may think “Wow I’d like to see more of this stuff. If they can sign up right there, they might. The AWeber help system specifically tells us that we can collect names at meetings and expos. You can have a clipboard where people sign up for you email list or a fishbowl where people put their business cards in the bowl to get signed up for your newsletter. Okay, the question is how to get them into the list. 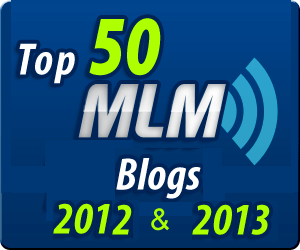 Here is a good article on Adding a Few People Manually to your List. I use a similar technique except I create a hidden page with just a Web Form on it. You need to enter less than 10 per day. Great Stuff Dr. Hale – great to chat with you while you were in the hospital! Reminds me of when I did calls with Ann Sieg when she was in the hospital many years ago! I appreciate your warm thought. I really enjoyed connecting with you guys while I was in the hospital. It really kept my spirits up! Loved this post that is chocked full of helpful tips for collecting lead names using Aweber. I didn’t know about tip#8…going to implement many of these this week. Thanks Hale…good stuff! I appreciate the post in our FB Group.